Gray is the new go-to neutral. Gone are the days when the color sparked gloom and drab thoughts. Now, home design experts call on grays for a modern and alluring exterior hue. 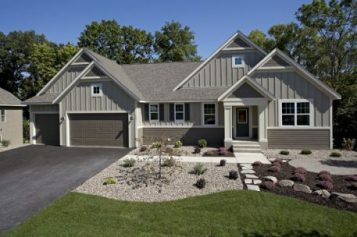 James Hardie’s HardiePlank® lap siding in Pearl Gray is the most popular pick of the Midwest. 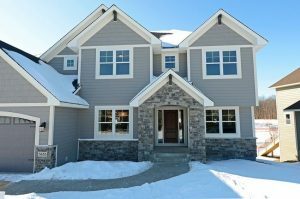 It’s a cooler, lighter gray, making it an ideal choice for a main siding color, especially when teamed up with a darker gray siding tone, such as Gray Slate or Aged Pewter. The contrast between the two colors provides a striking and smart level of contrast. There are various shades of gray in the ColorPlus® Technology collection of colors. You can opt for any shade from light to dark with Aged Pewter, Iron Gray and Night Gray, all of which pair nicely with each other. And with ColorPlus Technology, you can feel confident knowing that your gray siding, in any shade, resists fading. James Hardie’s ColorPlus Technology provides a baked-on, fade-resistant, consistent finish on your siding and trim that will last longer with lower maintenance than field-applied paint. Take a peek at the Pearl Gray meets darker gray standout combination—it may be your new favorite siding pair. This Minneapolis home is clad in straight edge HardieShingle® siding and HardiePlank lap siding in Pearl Gray on the upper portion of the home, and HardiePlank lap siding on the home’s lower level in Aged Pewter. Both of the gray tones standout with the HardieTrim® boards in bright Arctic White and match the natural stone nicely. HardiePanel® vertical siding in Pearl Gray and HardiePlank lap siding in Gray Slate clad this modern-looking Midwest abode. We love the matching darker gray garage door and gable details—it adds flow to the home’s exterior palette. The single-family home is clad in HardiePlank lap siding in Pearl Gray with staggered edge HardieShingle siding in the same color. 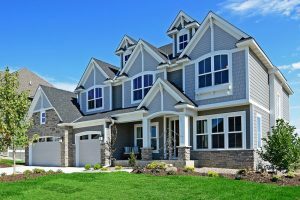 The colors blend and the two types of siding add a layer of interest. The Pearl Gray color pairs perfectly with the gray stone around the home’s entry and foundation.